Pet Shop Boys are an English synth-pop duo, formed in London in 1981 and consisting of Neil Tennant and Chris Lowe. Pet Shop Boys have sold more than 100 million records worldwide, and are listed as the most successful duo in UK music history by The Guinness Book of Records. Three-time Brit Award winners and six-time Grammy nominees, since 1985 they have achieved 42 Top 30 singles, 22 of them Top 10 hits in the UK Singles Chart, including four UK number ones: "West End Girls" (also number one on the US Billboard Hot 100), "It's a Sin", an acclaimed cover of "Always on My Mind", and "Heart". Other hit songs include a cover of "Go West", "Opportunities (Let's Make Lots of Money)" and "What Have I Done to Deserve This?" in a duet with Dusty Springfield. At the 2009 Brit Awards in London, Pet Shop Boys received an award for Outstanding Contribution to Music. In 2016, Billboard magazine named Pet Shop Boys the number one dance duo/group over the 40 years since the chart's inception in 1976. In 2017 the duo received NME's Godlike Genius Award. Neil Tennant (27) and Chris Lowe (22) met in a hi-fi shop on King's Road in Chelsea, London, in 1981. Tennant had purchased a Korg MS-10 synthesizer which sparked a conversation with Lowe, who was working in the shop at time. Discovering that they had a mutual interest in dance and electronic music, they began to work together on material, first in Tennant's flat in Chelsea, then, from 1982, in a small studio in Camden Town. They say their band name was taken from friends who worked in a pet shop in Ealing, and were known as the "pet shop boys". In August 1983, Tennant, who was an assistant editor at Smash Hits, went to New York to interview Sting. While there he arranged to meet Hi-NRG producer Bobby Orlando and gave him a demo tape containing "It's a Sin" and "Opportunities (Let's Make Lots of Money)". From 1983–84, Orlando recorded 11 tracks with Tennant and Lowe including "West End Girls", "Opportunities (Let's Make Lots of Money)", "It's A Sin", "I Want A Lover", "I Get Excited", "Two Divided By Zero", "Rent", "Later Tonight", "Pet Shop Boys", "A Man Could Get Arrested" and "One More Chance". In April 1984, the Orlando-produced "West End Girls" was released, becoming a club hit in Los Angeles and San Francisco. On 2 November, it was voted "Screamer of the Week" by listeners of Long Island, New York, radio station WLIR. It was a minor dance hit in Belgium and France, but was only available in the United Kingdom as a 12" import. In March 1985, after long negotiations, Pet Shop Boys cut their contractual ties with Bobby O, with a settlement giving Bobby O significant royalties for future sales. Hiring manager Tom Watkins, they signed with the London-based Parlophone label. In April, Tennant left Smash Hits magazine - where he had progressed to the position of deputy editor - and in July, a new single, "Opportunities (Let's Make Lots of Money)", was released, reaching number 116 in the UK. The B-side to this single, "In the Night", later resurfaced, in a longer remixed version, as the opening track to the duo's first remix album, Disco, in 1986. This version was also used as the theme for the UK television series The Clothes Show. A 30 second sample from "West End Girls", the Stephen Hague remake. Unperturbed by the low chart position, the band returned to the studio in August to re-record "West End Girls" with producer Stephen Hague. Released in October 1985, this new version initially entered the charts at a similarly low position, but began a slow rise so that, by January 1986, it achieved the top spot. It was subsequently number one in the United States, Canada, Finland, Hong Kong, Lebanon, Israel, New Zealand and Norway and sold an estimated 1.5 million copies worldwide. It remains the most-heard Pet Shop Boys song to date. After the success of "West End Girls", Pet Shop Boys released a follow-up single, "Love Comes Quickly", on 24 February 1986. The single reached number 19 in the UK Singles Chart and was followed by their debut album, Please, on 24 March. In June 1986, the band announced a European tour; however, their plans for a theatrical extravaganza proved to be too expensive and the tour was cancelled. Please started Pet Shop Boys' penchant for choosing one-word album titles, which Neil Tennant has since stated is now a Pet Shop Boys "signature thing", akin to e.e. cummings' use of exclusively lower case letters. New versions of their second single, "Opportunities (Let's Make Lots of Money)", and the album track "Suburbia" were also released in 1986, followed by a remix album, Disco. In September 1986, Pet Shop Boys performed "Love Comes Quickly" and "West End Girls" at the 1986 MTV Video Music Awards in Los Angeles. 1987 started with Pet Shop Boys receiving both a BRIT Award and Ivor Novello Award for "West End Girls". Later, on 15 June, they released what became their second number one single, "It's a Sin". The single caused some controversy: Tennant's school, St. Cuthbert's Grammar School, in Newcastle upon Tyne, chastised him in the press, while Jonathan King accused them of plagiarising the Cat Stevens song "Wild World". Pet Shop Boys later sued King and won damages, which were donated to charity. The video to "It's a Sin" also saw their first collaboration with director Derek Jarman. A sample of "It's a Sin", the lead single from Pet Shop Boys' 1987 album Actually. The continued success of "It's a Sin" was followed by the release of "What Have I Done to Deserve This?" on 10 August. Co-written with Allee Willis and also featuring Dusty Springfield on vocals, the single reached number two on the UK Singles Chart and the U.S. Billboard Hot 100 chart. Although the duo had wanted to release this track on their debut album, they had been unable to track down Springfield and were reluctant to record it with any other female singer, despite their record company's suggestions. Springfield's manager finally contacted them in 1986, following the release of Please, and towards the end of that year, she travelled to London to record "What Have I Done to Deserve This?" with them. It was the first track to be recorded for the duo's second album. Pet Shop Boys had been told that Springfield was difficult to work with and even that she could no longer sing; however, her performance on the track put any such concerns to rest and they began a collaboration with her, which lasted until the end of the decade. Included on their second album Actually, the song became a massive worldwide hit and resurrected Springfield's career, leading to her 1990 album, Reputation, on which Pet Shop Boys were major contributing writers and producers. This duet was also the start of a series of collaborations with high-profile musicians, going on throughout the band's career. Also in August 1987, Pet Shop Boys appeared on Love Me Tender, a UK television programme, on ITV, commemorating the tenth anniversary of Elvis Presley's death. They were asked to perform one of their favourite Elvis tracks and they narrowed it down to two options, "Baby Let's Play House" and "Always on My Mind", eventually settling on the latter. Their Presley cover would later be re-released in a 12" version, consisting of a medley, along with an acid house track by the duo, titled "In My House". This extended version, consistently called "Always on My Mind"/"In My House", would later be included on Pet Shop Boys' 1988 album, Introspective, with the 12" medley attached to the vinyl edition of their Actually album and only marketed in the United States in such double release. September 1987 saw the release of the duo's second studio album, Actually, followed by the single "Rent" in October, which reached number 8 in the UK. The final song on the album, "King's Cross" accidentally anticipated the King's Cross fire at the London Underground section of the station in November of that year (part of the lyrics read: "Dead and wounded on either side/You know it's only a matter of time"). The Sun newspaper in the UK subsequently tried to get the track released as a charity single, but Pet Shop Boys would not allow this. Towards the end of 1987, Pet Shop Boys started work on an hour-long film that would incorporate the songs from Please and Actually. Working with director Jack Bond, the short film grew into a full-scale movie, It Couldn't Happen Here, starring Barbara Windsor, Joss Ackland and Gareth Hunt. The film was eventually released in 1988 to mixed reviews. Footage from the film was also used for the music video to "Always on My Mind", now released as a single on 30 November; it became both the duo's third number one single in the UK and the Christmas number one single for 1987, beating "Fairytale of New York" by The Pogues. In November 2004, The Daily Telegraph newspaper placed Pet Shop Boys' version of "Always on My Mind" at number two in a list of the fifty greatest cover versions of all time. 1988 started with another collaboration. Pet Shop Boys wrote and produced the song "I'm Not Scared" for Patsy Kensit's band, Eighth Wonder. The song became her biggest hit single and the Pet Shop Boys included their own extended version of the track on their Introspective album. March 1988 saw the duo achieve their fourth UK number one single (and their last to date), with a remixed edit of "Heart", different from the album version. This single version would be included on their first and third greatest hits albums, Discography: The Complete Singles Collection and Ultimate, whereas the album version would be used for their second retrospective, the double PopArt: Pet Shop Boys – The Hits. The video to the single, directed by Jack Bond, starred Ian McKellen as a vampire who steals Neil Tennant's wife. In the 1996 BBC Radio 1 documentary About Pet Shop Boys, Neil Tennant noted that their "Imperial Phase" ended in 1988. On 12 September 1988, Pet Shop Boys released a brand new single, "Domino Dancing" and in the documentary Neil recounts his disappointment when hearing the news that the single had reached number 7 in the UK Singles Chart. He felt that their major success was now over and that it was going to be a challenge to maintain their level of success in the future. The duo's third studio album, Introspective, was released on 10 October 1988 (1988-10-10). Unusually, this was a six-track album of previously unheard remixes and new tracks in extended form. It was followed by the Trevor Horn-produced top-five single "Left to My Own Devices", and a cover version of the Sterling Void single "It's Alright", in 1989. 1989 also saw the start of Pet Shop Boys' first tour ever, in which they performed in Hong Kong, Japan, and Britain. The tour followed the ideas of the extravaganza that could not have been afforded earlier in their careers. Derek Jarman returned to direct the performance and he provided several films that were projected during the shows. On 24 September 1990, a new single, "So Hard", was released, reaching No.4 in the UK and Pet Shop Boys' fourth studio album followed, on 22 October 1990. Titled Behaviour, it was recorded in Munich, with producer Harold Faltermeyer. The album was not intended to reflect a dramatic change in mood from their earlier albums; however, it is noticeably subdued. It included the fan-favourite "Being Boring", the second single from the album, which only reached No.20 in the UK Singles Chart, their lowest placing at the time. The song was inspired by a quote by Zelda Fitzgerald: "...she refused to be bored chiefly because she wasn't boring", and was widely thought to be a commentary on the AIDS epidemic. The music video was directed by filmmaker Bruce Weber. By this time, the duo had also parted ways with manager Tom Watkins, replacing him with Jill Carrington, who had previously been marketing director at Polydor. In March 1991, a cover of U2's "Where the Streets Have No Name" as a medley with "Can't Take My Eyes Off You", the 1960s pop song by Frankie Valli/The Four Seasons, was released as a double A-sided single with a remix of the album track "How Can You Expect to Be Taken Seriously?" by Brothers in Rhythm. This was followed by the duo's first world tour. Named Performance, the tour kicked off in Tokyo, on 11 March 1991. The tour also visited the United States, Canada, France, Belgium, Germany, Denmark, Sweden, Finland, Czechoslovakia, Austria, Hungary, Yugoslavia, Switzerland, Italy, Spain, the Netherlands, Ireland, and the United Kingdom. The shows were designed by David Alden and David Fielding, who had designed several sets for the Royal Opera House. Before taking a break in 1992, in 1991 the Pet Shop Boys released an 18-track compilation called Discography, which included all of their single releases up until then, two new singles—"DJ Culture" and "Was It Worth It? "—and only omitted "How Can You Expect to Be Taken Seriously?" (although it did appear on the video companion Videography). While "DJ Culture" had some success, "Was It Worth It?" became the duo's very first single to miss the UK Top 20 since their two Bobby O debut singles. During this period, Pet Shop Boys continued to collaborate with many high-profile musicians. They worked again with Dusty Springfield, on the singles "Nothing Has Been Proved" (which was a song written for their soundtrack for the film Scandal about the Profumo political scandal in Britain) and "In Private". The duo later went on to produce half of the tracks on her 1990 solo Reputation album. Pet Shop Boys were also asked to write and produce an album for Liza Minnelli, in 1989. The album, Results, generated four singles, including the hit single "Losing My Mind", a cover version of the Stephen Sondheim song from the 1971 Broadway musical "Follies". The duo's own demo of this appeared on their "Jealousy" single as a B-side. Neil Tennant worked with Bernard Sumner and Johnny Marr on their first album as Electronic, whose first single, "Getting Away with It", co-written and co-produced by Tennant, was released on 4 December 1989. Later, in 1991, Lowe also contributed to the Electronic project, contributing the chord sequence to "The Patience of a Saint" on their 1991 album. In 1992, Tennant sang lead vocals on the non-album single "Disappointed", which was featured on the soundtrack to the movie Cool World. In addition, a remix of "So Hard", by notorious electronic music duo The KLF, released as a separate single, led to Tennant re-recording his vocals for the song entirely. Pet Shop Boys set up the Spaghetti Records label in 1991. Their most successful release was the soundtrack to the 1992 film The Crying Game, which featured Boy George performing the title song "The Crying Game". The song was produced by Pet Shop Boys and featured Tennant on backing vocals. Other artists on the label included Scottish singer Cicero, The Ignorants, and Masterboy. In 1992, Pet Shop Boys were the subjects of a South Bank Show documentary on ITV. This included interviews with Neil and Chris, and contributions from Liza Minnelli, Eric Watson (photographer and video director), Simon Frith (music critic), David Alden and David Fielding. In June 1993, Pet Shop Boys re-invented their image and made a strong return to the UK Singles Chart with "Can You Forgive Her?". Taking its title from the Anthony Trollope novel of the same name, the single reached number 7 on the UK Singles Chart, while its iconic music video featured the duo in orange body suits and tall dunce caps, in a world of computer-generated imagery. The theme was continued with the follow-up single, often considered as their signature song, a cover of the Village People single "Go West", which reached number 2 in the UK, with another computer-generated music video, this time inspired by the Soviet Union. The tune was adopted into a football chant at Arsenal Football Club (which Chris Lowe supports) and is heard at grounds throughout Europe to this day. The duo's fifth studio album, Very, followed on 27 September and is the only Pet Shop Boys album to reach number one on the UK Albums Chart. It was produced by Pet Shop Boys and mixed with additional production by Stephen Hague, who had produced their first album and had subsequently produced records by OMD, New Order and Erasure. The other singles from Very, "I Wouldn't Normally Do This Kind of Thing", "Liberation" and "Yesterday, When I Was Mad", continued the theme of CGI videos, peaking with the "Liberation" video, which contained almost no real-life elements at all. All these videos were directed by Howard Greenhalgh, who continued to work with Pet Shop Boys well into the next decade. Very was also released in a limited edition including an entirely new album, Relentless, which was composed of six all-new progressive house tracks, with a darker tone to the perky Very. In 1994, Pet Shop Boys offered to remix fellow Parlophone act Blur's single "Girls & Boys"; it was a club hit throughout Europe and started a sporadic trend for Pet Shop Boys to remix other artists' music. Also in 1994, Pet Shop Boys released the 1994 Comic Relief single, "Absolutely Fabulous". The song started when Tennant and Lowe were playing around with samples from the BBC sitcom Absolutely Fabulous in the studio. They wanted to release a single, so approached lead actors Jennifer Saunders and Joanna Lumley and suggested releasing it as a charity single. The single was released under the artist name of 'Absolutely Fabulous' too. Tennant and Lowe do not consider it as a Pet Shop Boys single release and it was not included on their next best-of album. The video to the single featured clips from the sitcom, along with newly recorded footage of Tennant and Lowe with the characters of Edina (Saunders) and Patsy (Lumley). On 12 September 1994, Pet Shop Boys released the follow-up to their 1986 remix album Disco, in the form of Disco 2. The album featured club remixes of the singles released from Very and Behaviour, in a continuous megamix by Danny Rampling. Then, in October, Pet Shop Boys began their Discovery tour, which would see them visit areas that they had never performed in before: Singapore, Australia, Puerto Rico, Mexico, Colombia, Chile, Argentina and Brazil. The following year, a new version of "Paninaro", the 1986 B-side to "Suburbia", was released to promote the B-sides collection Alternative. The single, called "Paninaro '95", is based on the live version from the Discovery tour. The Pet Shop Boys remix of the David Bowie song "Hallo Spaceboy" (co-written by Brian Eno), from the album Outside, featured Tennant on backing vocals and was released in the UK on 19 February 1996. The Pet Shop Boys then joined Bowie during his performance of the song at the 1996 BRIT Awards ceremony, as well as an appearance on the Top of the Pops television program. In April, Pet Shop Boys released a new single, "Before", leading up to their forthcoming album; the single reached number 7 in the UK Singles Chart. That same month, Tina Turner also released her Wildest Dreams album, which featured the Pet Shop Boys-produced track "Confidential". In August, Pet Shop Boys released a follow-up single, "Se a vida é (That's the Way Life Is)", a Latin American music-inspired track, featuring a drum sample from a track called "Estrada da paixão" by Brazilian act Olodum. This preceded the sixth Pet Shop Boys album Bilingual, which was released in September. In December 1996, Neil appeared live with Suede, singing the Suede song "Saturday Night" as a duet with Brett Anderson and Pet Shop Boys track "Rent". Both live tracks were released with the Suede single "Filmstar" in July 1997. Pet Shop Boys kicked off Summer 1997 with a sold-out three-week residency at the Savoy Theatre, in London, in June. Titled Somewhere and being promoted by a cover version of the song "Somewhere" from the musical West Side Story, the shows used projections filmed by the artist Sam Taylor-Wood. Pet Shop Boys would later work with Sam Taylor-Wood again: in 1998, they recorded a version of "Je t'aime... moi non plus", originally by Serge Gainsbourg, with her and again in 2003, they covered the Donna Summer track "Love to Love You Baby", and gave it a limited edition release credited to Kiki Kokova, a pseudonym used by Taylor-Wood for this project. The majority of 1998 was spent with a series of live dates and minor releases, including a charity album of Noël Coward songs, called Twentieth Century Blues. The album included Pet Shop Boys' version of "Sail Away", along with songs performed by Elton John, Texas, Marianne Faithfull, The Divine Comedy, Suede, Damon Albarn, Vic Reeves and Robbie Williams. Tennant also co-produced the Williams track and provided backing vocals for Elton John. Tennant provided backing vocals on Robbie Williams' "No Regrets" single, along with Neil Hannon from The Divine Comedy. Meanwhile, the band switched managers again as Carrington resigned and was succeeded by Mitch Clark, who had previously worked for EMI International as Head of Promotion. During this time, Pet Shop Boys began to work with playwright Jonathan Harvey on a stage musical project. In 1999, many of the tracks recorded ended up on the duo's seventh studio album, Nightlife, which included the Top 20 singles "I Don't Know What You Want But I Can't Give It Any More" and "New York City Boy", the Top 10 hit "You Only Tell Me You Love Me When You're Drunk", "Closer to Heaven"—which would later become the title of Pet Shop Boys' musical—as well a duet with Kylie Minogue, "In Denial", about a father coming out to his daughter. Minogue later performed the track live, during her 2005 Showgirl tour, singing to a pre-recorded Neil Tennant. This is not the first time that Pet Shop Boys have worked with Minogue: in 1994, they indeed wrote a song for inclusion on her eponymous Kylie Minogue album, called "Falling", which was based on an unreleased remix of "Go West" with new lyrics by Tennant; however, Minogue and her record company did not like the production sound of Pet Shop Boys' demo and asked Farley & Heller to finally produce the track. 1999 ended for the duo with a world tour, which continued well into 2000, this time with the stage sets designed by architect Zaha Hadid. The tour took them to the United States, Canada, Japan, Europe and the UK. In the Summer of 2000, they also played a series of festival dates in Europe, including a performance at the Glastonbury Festival, where they performed on the main stage, on Saturday night, at 9:30 pm, to a triumphant reception. In 2000, they won their third Ivor Novello Award, honouring their "Outstanding Contribution" to music. Throughout 2000, they continued to work on their musical and in May they started workshopping the project and finalising the plot and songs to be used. The musical, Closer to Heaven, opened at the Arts Theatre in London, in 2001, with financial backing from Andrew Lloyd Webber's Really Useful Group. Reviews were mixed and although the run was initially extended, it closed earlier than expected, due to poor ticket sales, in October 2001. Around the time of the London closure, Tennant said that they were in talks to take the musical to various locations in Europe (particularly Germany, which is a big market for Pet Shop Boys) and to take it to New York. Nothing further was issued by the Pet Shop Boys or Really Useful Group regarding these performances; in 2005, a series of performances were staged in the Brisbane Powerhouse, Australia, though they were arranged independently of Pet Shop Boys and the Really Useful Group. In July 2017, Pet Shop Boys reissued Nightlife, as part of their ‘Catalogue: 1985-2012’ series. It features the remastered album, plus bonus tracks, demos and Pet Shop Boys’ remixes of their tracks. After the mixed fortunes of Closer to Heaven, Pet Shop Boys returned to the studio to start work on their eighth album. After toying with genres including hip hop, they went for a stripped back acoustic sound as a complete change from the over-the-top dance music of the musical. In 2002, they released the modestly successful album Release. Most of the tracks were produced by the duo themselves and many featured Johnny Marr on guitar. The first single, "Home and Dry", featured a very peculiar video, directed by Wolfgang Tillmans, mostly consisting of raw camcorder footage of mice filmed in the London Underground. The follow-up single "I Get Along" had a video filmed by Bruce Weber, and after this they embarked on another world tour, although this time it was a stripped back affair, with no dancers, backing singers, costumes or lavish sets. They used two extra guitarists, Bic Hayes and Mark Refoy, a percussionist (Dawne Adams) and regular programmer (Pete Gleadall) alongside Chris Lowe (keyboards) and Neil Tennant (vocals and guitar). The tour took them first to several universities around the UK; these dates saw them perform at Bristol University, Keele University, University of East Anglia in Norwich, University of Teesside, Middlesbrough and De Montfort University, Leicester. Subsequent dates took them to Germany, the U.S., Canada, Spain, Italy, France, Belgium, the Netherlands, Denmark, Sweden, then another series of dates in the UK again, Switzerland and onto Japan, Singapore, Hong Kong and then a first-ever date in Thailand as the final show, at the large Bangkok Impact Arena, in front of 9,000 fans. A third single, "London", was only released in Germany, at the request of EMI Germany. It was never planned for release in the UK, although a promotional video was shot by the distinguished photographer Martin Parr and it was serviced to some UK radio stations. Following a live stint on the John Peel show on Radio 1, Pet Shop Boys released Disco 3, in February 2003. The album followed their previous Disco albums, but this one also included new songs as well as remixes. In 2003, Pet Shop Boys launched two new labels, Olde English Vinyl and Lucky Kunst, their Spaghetti Records label becoming defunct. The first release on Olde English Vinyl was Atomizer's "Hooked on Radiation", followed by Pete Burns' "Jack and Jill Party" in 2004. The only Lucky Kunst release to date is the mentioned Kiki Kokova's version of "Love to Love You Baby". They also remixed Yoko Ono's "Walking on Thin Ice" in 2003 and Rammstein's "Mein Teil" in 2004. Another new manager, David Dorrell, was brought on board to replace Clark. In November 2003, Pet Shop Boys released a second greatest hits album, PopArt: Pet Shop Boys – The Hits, a double compilation with two new singles: "Miracles" and "Flamboyant". Not chronologically arranged, the tracks were divided into two discs: Pop including the more traditional pop songs and Art containing those works which were considered more experimental. In September 2004, Pet Shop Boys appeared at a free concert in Trafalgar Square in London, where they performed, with the Dresdner Sinfoniker orchestra, a whole new soundtrack to accompany the seminal 1925 silent film Battleship Potemkin. There were four further live performances of the work with the Dresdner Sinfoniker in Germany in September 2005. The Battleship Potemkin soundtrack was then released on 5 September 2005. In November 2004, Pet Shop Boys played at the Prince's Trust concert titled Produced by Trevor Horn with other artists who had worked with the British producer Trevor Horn, including Grace Jones, ABC, Seal and Frankie Goes to Hollywood. In 2005, Pet Shop Boys was selected as the headline act for the Moscow Live 8 concert, in Red Square. They were received extremely well by the crowd in Moscow. Also in 2005, Pet Shop Boys were asked to put together the twentieth release in the Back to Mine series, an ongoing anthology showcasing artists' favourite music selections, with an emphasis on afterhours chill-out music. As a condition, Neil Tennant and Chris Lowe were given one disc each, whereas all previous releases in the series consisted of only a single disc per group (see Back to Mine: Pet Shop Boys). In July 2017, Pet Shop Boys reissued Release, as part of their ‘Catalogue: 1985-2012’ series. It features the remastered album, plus bonus tracks, demos and Pet Shop Boys’ remixes of their tracks. Pet Shop Boys began 2006 remixing Madonna's single "Sorry", for release in February. The single reached number one in the UK and the Pet Shop Boys remix included new backing vocals performed by Tennant. Madonna subsequently used the Pet Shop Boys remix, including Tennant's vocals, on her 2006 Confessions Tour. In April, Pet Shop Boys released a new single that reached No. 8 in the UK, "I'm with Stupid", a commentary on the relationship between George W. Bush and Tony Blair. The promo video featured Matt Lucas and David Walliams, better known as the team behind Little Britain. Lucas and Walliams portray Tennant and Lowe, parodying two of the duo's previous videos, "Go West", and "Can You Forgive Her?". The ninth Pet Shop Boys studio album, Fundamental, followed in May, reaching a strong No. 5 in their home country. The album was produced by Trevor Horn, who Pet Shop Boys had previously worked with on "Left to My Own Devices", in 1988. The album was also released with a limited edition remix album called Fundamentalism, which included a version of "In Private" as a duet with Elton John and "Fugitive", a new track produced by Richard X. The week that Fundamental was released, a documentary, titled Pet Shop Boys – A Life in Pop, was broadcast on Channel 4, directed by George Scott and produced by Nick de Grunwald. The original broadcast was less than an hour in duration; a 140-minute version was released on DVD in October 2006. Contributors to the programme included Robbie Williams, Brandon Flowers, Tim Rice-Oxley, Jake Shears and Bruce Weber. The DVD also contained promo videos that had been made since the release of PopArt, although the promo for "Flamboyant" only appeared on early pressings of the DVD. The second single to be taken from the album was the UK top twenty "Minimal". The duo filmed the video to the single in Paris with Dan Cameron. The single was the first of theirs to be playlisted by London's biggest radio station, Capital Radio, in a decade. 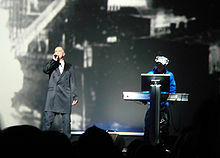 Pet Shop Boys began a worldwide tour in support of Fundamental in June 2006 in Norway. The show was designed and directed by Es Devlin, the award-winning British theatre designer, and choreographed by Hakeem Onibudo. 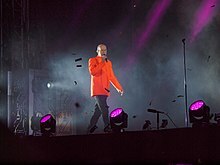 Between 15 June and 10 September 2006, Pet Shop Boys played a series of concert dates across Europe, mainly at assorted festivals and outdoor venues. These included two dates at the Tower of London on 28 June and 29, and a single show at Thetford Forest. These dates also included performances of Battleship Potemkin, in Germany and Spain. On 1 May 2006, Battleship Potemkin was also performed at the Swan Hunter shipyard, in Newcastle upon Tyne, with Pet Shop Boys accompanied by the Northern Sinfonia orchestra. On 3 October 2006, the long-delayed U.S. release of their PopArt hits package was issued by Capitol Records. During 2006, Pet Shop Boys worked with Robbie Williams on his then-new album, Rudebox, producing two tracks: a cover version of "We're the Pet Shop Boys", written by My Robot Friend (which they have also recorded themselves and released as a B-side to "Miracles", in 2003) and "She's Madonna", a duet with Tennant, allegedly about Guy Ritchie's affair with Tania Strecker, prior to his relationship with Madonna. On 10 October 2006, Pet Shop Boys embarked on the North and Central American leg of their world tour, which took them through Canada, the United States and Mexico, concluding on 16 November. A DVD of the show in Mexico City was released on 21 May 2007, titled Cubism. It was recorded on 14 November 2006, in the Auditorio Nacional, and was directed by David Barnard. On 16 October, Catalogue was published by Thames & Hudson, a 336-page hardcover book, written by Philip Hoare and Chris Heath, detailing their entire visual output (photography, as well as the design of albums, videos, concert tours, books and fan club magazines) from 1984 to 2004. Neil Tennant comments in the book: "In the beginning we made a decision – and it was in our EMI contract – that that we would have control over how everything worked; that obviously the songs mattered hugely, but the way they were presented was going to matter hugely as well; and that we were never going to give up on that." Pet Shop Boys supported the publication of the book with signings in London, New York City, Los Angeles and Berlin. To coincide with the publication of Catalogue, a small exhibition of portraits of Pet Shop Boys opened in the Bookshop Gallery of London's National Portrait Gallery, on 30 October 2006 and ran to 28 February 2007. Also on 16 October, the third single from Fundamental, "Numb", was released, following its appearance at the end of the BBC's coverage of England at the World Cup. It was written by Diane Warren and is the only song on the album not written by Tennant and Lowe. "Numb" became only the second Pet Shop Boys single in their career to miss the Top 20. On 23 October 2006, Concrete was released. It is a double CD of the complete Mermaid Theatre concert, with the BBC Concert Orchestra (musical director: Trevor Horn), featuring guests Rufus Wainwright, Frances Barber and Robbie Williams. A 90-minute "director's cut" of the concert aired on BBC 6 Music, on 28 August 2006. On 7 December 2006, Pet Shop Boys were nominated for two 2007 Grammy Awards. These were 'Best Dance Recording' for "I'm with Stupid", and 'Best Electronic/Dance Album' for Fundamental. During the latter part of 2006 and early 2007, Neil Tennant served as executive producer on Rufus Wainwright's new album, Release the Stars, recorded in Berlin. He also sang backing vocals on a number of tracks, most notably on "Do I Disappoint You", and "Tiergarten". In February 2007, Pet Shop Boys' 'Stars Are Blazing' remix of The Killers' "Read My Mind" was released. Pet Shop Boys continued their world tour, albeit with a slightly different production and set-list, on 14 March 2007, in Rio de Janeiro, Brazil then played concerts in Argentina, Chile, New Zealand and Australia (as co-headliners of the V Festival 2007), Norway, Estonia, Latvia, Lithuania, Germany, Switzerland, France, the Netherlands, Great Britain, Denmark, Ireland, Sweden, Italy, Spain, Belgium and Singapore. Pet Shop Boys "played" at the free festival Secondfest, in the online virtual world Second Life, on 30 June. On 8 October 2007, Pet Shop Boys released Disco 4, the latest in their series of remix albums; the fourth in the set differed in that it was largely made up of remixes, completed by Pet Shop Boys, of other artists' work over the past decade. These include The Killers, David Bowie, Yoko Ono, Madonna, Atomizer and Rammstein. Only two tracks by Pet Shop Boys, remixed versions of Fundamental tracks "Integral" and "I'm with Stupid", were included. The Fundamental tour ended in Bucharest, Romania, in November 2007. In October 2008, Pet Shop Boys released the single "I'm in Love with a German Film Star" featuring famous British photographer Sam Taylor-Wood on vocals. This single was made for her exhibition in London and it was released by Kompakt records in Germany, on both CD and 7" and 12" vinyl. The most notable remixes were by Gui Boratto, Juergen Paape and Mark Reeder, who also made a special mix in 5.1 surround. In July 2017, Pet Shop Boys reissued Fundamental, as part of their ‘Catalogue: 1985-2012’ series. It features the remastered album, plus bonus tracks, demos and Pet Shop Boys’ remixes of their tracks. Pet Shop Boys completed their next album in late 2008. Recorded with Xenomania and released in UK on 23 March 2009, Yes was a critical success and hit No. 4 in the UK, their highest album chart position in more than a decade. Pet Shop Boys also appeared on Girls Aloud's new album Out of Control, collaborating on the Top-10 track "The Loving Kind", released on 12 January 2009 as a single. In February 2009, Pet Shop Boys received the British Phonographic Industry's most prestigious accolade, the award for outstanding contribution to British music, at the 2009 Brit Awards ceremony held at the Earls Court Arena in London. During the performance at this show, Pet Shop Boys collaborated with Lady Gaga and Brandon Flowers (of The Killers). This led to their collection album PopArt charting at number 18 on the UK albums chart, higher than when it was originally released. On 22 March 2009, the first single from the album "Love etc." charted in the UK at number 14, and on 29 March 2009, Yes charted at number 4. Subsequent singles released from the album were "Did You See Me Coming?" and the Germany-exclusive "Beautiful People". The two internationally released singles from Yes, "Love etc" and "Did You See Me Coming? ", both hit the top spot on the US Dance Chart, their ninth and tenth No. 1s on that chart. A new official website was also released in 2009 following the new album and tour. The design maintained many aspects used on the previous site made by London-based design company Airside. The site contains many photos, news updates and a feature introduced on the previous site incarnation known as 'Pet Texts' where both Neil and Chris can send in a message from their phones which automatically appears on the website for public viewing. They also used social networking site Twitter for a short period before returning to only 'Pet Texts'. On 10 June 2009, Pet Shop Boys started the summer leg of their Pandemonium Tour in Saint Petersburg, Russia and ended on 21 July 2009 in Tel Aviv, Israel, playing the Manchester Apollo and a sold-out gig at O2 Arena on 18 and 19 June 2009 respectively. The second leg of the tour started on 29 August 2009 at the Metropolis, in Montreal, Canada. The Pandemonium Tour showcases songs from previous album Yes as well as older songs such as "West End Girls", "It's a Sin" and "Always on My Mind". The tour also showcases songs that have not been performed live in the past, such as "Two Divided by Zero", "Why Don't We Live Together?" and the B-side "Do I Have To?". On 4 November 2009, Pet Shop Boys celebrated the Brazilian leg of the tour by releasing a compilation titled Party, including songs that were heavily featured in the following TV Globo soap operas: "Being boring" (Meu Bem Meu Mal OST), "Domino dancing" (O Salvador da Patria OST), "West End Girls" (Selva de Pedra OST) and "King of Rome" (Viver a Vida). On 14 December 2009, Pet Shop Boys released an EP of covers, remixes, and new material, titled Christmas. On 20 December the EP entered the UK chart at No. 40. On 15 February 2010, Pet Shop Boys released a live album/DVD double-pack called Pandemonium. It contains the soundtrack and footage recorded from their 21 December 2009 show at the O2 Arena in London. The recording entered the UK Albums Chart at 29 and hit the number one spot on the "Electro and Synth" chart on both the UK and US versions of Amazon. In January 2010, it was announced through the band's Twitter profile that they were back in the studio recording. In April 2010, as part of Record Store Day 2010 celebrations, Pet Shop Boys released their version of "Love life", a song they originally recorded during the Release sessions in 2001 and subsequently gave to Swedish band Alcazar. Released as a limited edition 7-inch dinked vinyl single available only in independent UK record stores, its B-side was "A Powerful Friend", a song originally composed in the early 1980s and subsequently recorded in late 2002 during the recording sessions that would contribute to the Disco 3 album. In June 2010 Pet Shop Boys headlined the Other Stage on the Saturday evening of the Glastonbury Festival and were heralded as dazzling with "one of the most spectacular Glastonbury moments ever." On 1 November 2010, Pet Shop Boys released Ultimate, a single CD greatest hits album. This was preceded by the single "Together". On 15 November 2010, tickets went on sale for the Pet Shop Boys' second foray into British theatre, this time for a ballet. An adaptation of The Most Incredible Thing, a fairy tale by Hans Christian Andersen, opened at Sadlers Wells in London on 17 March 2011. The story has been adapted by Matthew Dunster and features choreography by Javier de Frutos. It features former Royal Ballet star Ivan Putrov, animated films created by Tal Rosner, and orchestrations by German composer Sven Helbig, who worked with the band in 2005 as a co-producer for Battleship Potemkin. On 4 April 2011, it was announced that Pet Shop Boys would tour with Take That on their Progress Live tour, and that while doing so, they would be writing new songs. Neil Tennant performing at Pori Jazz in Finland in 2014. Chris Lowe performing at Pori Jazz in Finland in 2014. On 28 September 2011, Pet Shop Boys announced that they had written 16 songs for their next studio album and expected to start recording the new songs in November 2011 for release in Autumn 2012. In the meantime, Format, an album of the duo's B-sides from 1996 to 2009 was released on 6 February 2012 as a sequel to their earlier B-side collection Alternative. Format entered the UK charts at No.26 on 12 February 2012. On 21 November 2011, the Beyond Theatre Award, was presented to Pet Shop Boys and the director of The Most Incredible Thing, Javier de Frutos. The award was introduced and presented by the artist, film director and occasional PSB collaborator Sam Taylor-Wood. In January 2012, Pet Shop Boys announced on their official website that they had started recording their new album in Los Angeles with producer Andrew Dawson. On 9 June 2012, a film by renowned Los Angeles artist/film-maker Brian Bress for the album track "Invisible" began to be circulated on the web and was posted to the official site and the band's YouTube page on 11 June, at which time Elysium was revealed to be name of the new album. On 25 June 2012, "Winner" was revealed as the title of the first single from the new album Elysium. It premiered on the Ken Bruce Show on BBC Radio 2 on 2 July 2012. Elysium was released in the UK on 10 September 2012 and in other countries the weeks before and after. On 27 June 2012, Pet Shop Boys performed three songs before the Olympic tennis games in Henman Hill, Wimbledon: "Always On My Mind", "What Have I Done to Deserve This? ", and "Winner". On 28 June 2012, Pet Shop Boys announced release date and the complete track listing for Elysium, produced in Los Angeles during 2012 by Andrew Dawson and Pet Shop Boys, released in September on Parlophone/EMI. On 3–8 August 2012, an EP, Winner, was released in the US and Europe by iTunes Store, Amazon.com and other online retailers. Pet Shop Boys performed "West End Girls" in the closing ceremony of the 2012 Olympic Games on 12 August 2012. The second single released from Elysium was "Leaving", on 15 October. The album's third single, "Memory of the Future" was released in December 2012 including the b-side "Listening" which Pet Shop Boys wrote for Morten Harket from a-ha, and a mixed version of the song (with backing vocals from Tennant) appeared on his solo album "Out of my hands" in April 2012. In December 2012, Pet Shop Boys played a free concert in the recently opened MediaCityUK BBC facilities, accompanied by the BBC Philharmonic Orchestra and the Manchester Chamber Choir. They played mostly songs that hadn't been performed before including 'Miracles' and 'The Survivors'. A piece entitled 'He Dreamed of Machines'—taken from the band's project associated with Alan Turing—was also performed for the first time. We’d like to thank everyone we’ve worked with at Parlophone over the last 28 years both in the UK and abroad. When we signed to the label in 1985 we had no idea how long and successful a relationship we were embarking on. However it is also exciting now to commence a new phase working with a new team in a new business structure and we look forward to a creative and equally fulfilling relationship with Kobalt. The twelfth album, entitled Electric, was released on 12 July 2013. The album was the biggest-selling record among the UK's independent record shops during the week of its release, and went straight to the number 1 position on the Official Record Store Chart. The album was produced by Stuart Price and the release coincides with the 'Electric World Tour' that will include Chile, Argentina, Paraguay, Brazil, Colombia, Asia (the duo will perform in the Philippines, Indonesia, and China for the first time), Lebanon, Israel, Turkey, Europe and North America. On 23 July 2014, the Pet Shop Boys new work A Man from the Future received its world premiere at the 2014 BBC Proms. Performed by the BBC Singers, BBC Concert Orchestra and the Pet Shop Boys, the work was inspired by the life of WW2 code breaker Alan Turing and was orchestrated by Sven Helbig. The concert also included Overture to Performance, an orchestral arrangement of Pet Shop Boys songs used to open their 1991 Performance tour, and four Pet Shop Boys songs arranged by Angelo Badalamenti and sung by Chrissie Hynde - "Vocal", "Love is a Catastrophe", "Later Tonight" and "Rent". On 6 September 2014, it was announced on the duo's website that they plan to begin work on their thirteenth studio album in November. Pet Shop Boys performed on stage with South Korean girl group f(x) at the end of the year MAMA Awards on December 2, 2015. On 21 January 2016, Pet Shop Boys announced that their thirteenth album, Super, would be released on 1 April. The announcement was accompanied by the release of an album teaser track, "Inner Sanctum". The lead single from the new album, entitled "The Pop Kids", was released on 18 March 2016. "The Pop Kids" was the duo's eleventh number one on the US Dance Club Songs chart. In July 2016, they performed the 'Inner Sanctum' tour, for four nights at the Royal Opera House in London. The subsequent Super Tour started in October 2016. On 7 June 2017, Pet Shop Boys announced their latest 'Further Listening' reissues project, called ‘Catalogue: 1985-2012’. The first batch was released on 28 July 2017, starting with the release of a 2017 remaster of ‘Nightlife’, ‘Release’ and ‘Fundamental’. On 31 August 2017, Pet Shop Boys announced that the reissues for 'Yes' and 'Elysium' would be released on 20 October 2017. Previously released 'Further Listening' albums will also be remastered for 2018, with 'Please', 'Actually' and 'Introspective' reissues being released on 2 March 2018. The fourth and final batch of reissues - 'Behaviour', 'Very' and 'Bilingual' - was released on 31 August 2018. On 4 September 2018, Pet Shop Boys announced on their official Facebook page, that writing the next studio album would continue through the rest of 2018. They have been writing throughout the year and so far have 21 new songs. The yet-untitled album is being produced by Stuart Price, and it is expected to be released in the second half of 2019, with a tour following due summer 2020. It is their third body of work produced by Stuart Price in a row, following the successful and highly acclaimed albums Electric (2013) and Super (2016). On 29 January 2019, Pet Shop Boys announced a live album/DVD/Blu-ray release called Inner Sanctum. It contains the soundtrack and footage recorded from their July 2018 four-date residency at London's Royal Opera House, as well as the duo's 17 September 2017 show at the Rock in Rio festival in Brazil. It was released on 12 April 2019. On 5 February 2019, Pet Shop Boys announced a new EP called Agenda. It contains 4 brand new songs that has been produced by Tim Powell and Pet Shop Boys, and was released on 8 February 2019. I don't like country and western. I don't like rock music, I don't like rockabilly or rock and roll particularly. I don't like much, really, do I? But what I do like, I love passionately. The quote was subsequently sampled in the song "Paninaro", and further established the band's early reputation of being anti-rock'n'roll and aligned with disco and dance music culture. The 1997 B-side "How I Learned to Hate Rock and Roll", and their 1991 songs "DJ Culture", "Can you forgive her?" and "How can you expect to be taken seriously?" continued this sentiment. Lowe and Tennant have since refuted this claim by mentioning since the rise of House, Rave and Disco, they are not so against rock as stated in multiple interviews when asked about it. This band dynamic has played a role in their public image as well. Early in their career, the duo were frequently accused of lacking stage presence, said to be a deliberate reaction to the hyper-cheerful music of the time, demonstrated by bands such as Wham!. A typical early performance featured Lowe in the background playing the bassline on a Fairlight synthesiser keyboard and Tennant singing, but otherwise passive, in the foreground. Tennant and Lowe both became well known for standing still throughout performances. 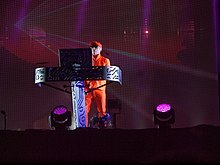 In a 2016 interview, Chris Lowe said the duo's live performances was a response to the music scene in the 1980s: "Everyone was so active. It was a big party where everyone was having a great time and smiling at the camera. Thumbs aloft! We just didn’t want to do that. So we ignored the cameras and the jollity of the situations. Let’s face it, it’s easier to stand stock-still isn’t it?". However, when they first began touring, in 1989, they were heavily influenced by opera and theatre staging. Derek Jarman staged their first tour, making a series of films to be projected behind the costumed singers and dancers. In 1991, they brought in David Alden and David Fielding, from the English National Opera, to create the staging and costume design, for a show which made little attempt to involve or even acknowledge the audience and pushed the choreography and staging centre stage. Subsequent tours have used artist Sam Taylor-Wood and architect Zaha Hadid for stage design. The Fundamentalism tour in 2006–2007 was conceived and designed by theatre designer Es Devlin, with choreography by Hakeem Onibudo. Es Devlin also conceived the 2009–2010 Pandemonium Tour as well as the Electric Tour beginning in 2013. Typically, Pet Shop Boys have favoured avant-garde tailored fashions. Tennant has referenced the designers of his suits in certain interviews and Lowe has often sported outfits and glasses made by Issey Miyake, Stüssy and Yohji Yamamoto's Y-3 for Adidas. Presentation has always been a major theme for Pet Shop Boys and the duo have dramatically "re-invented" their image twice in their career. In 1993, when promoting their Very album, they wore brightly coloured costumes and used state-of-the-art computer technology to place themselves in a modern computer graphic world. This concept of re-invention was revisited for the promotion of their Nightlife album, in which they transformed their look, wearing wigs and glasses, with stylised futuristic urban wardrobes. In 2006, both Tennant and Lowe were seen on stage and in photographs wearing clothes designed by Hedi Slimane/Dior Homme. The duo have always been interested in the artwork, design and photography of their own releases. Photographer Eric Watson helped shape the original image of Pet Shop Boys, creating many of their photographs and videos from 1984 to 1991. In design they have primarily worked with Mark Farrow, who designed the cover of their first Parlophone album release in 1986. The collaboration between Mark Farrow and Pet Shop Boys is comparable to the designer/band relationship of Peter Saville and New Order, Anton Corbijn and Depeche Mode, or the epic-length collaboration of Simon Halfon and Paul Weller. Their record sleeves are quite often very minimal and the attention to detail is obvious. In October 2006, British art publisher Thames & Hudson published a 336-page hardcover book titled Pet Shop Boys Catalogue, by Chris Heath and Philip Hoare, showcasing the group's accomplishments in artwork, design and music. A German-language edition was also published. An exhibition of photographs of Pet Shop Boys was organised at the National Portrait Gallery in London to coincide with the publication. Even the band's fan base has been subject to commentary. In 2001, music theorist Fred Maus wrote that, contrary to the ideologies of anti-commercialism and authenticity embodied by "serious" discussions of popular music such as rock, Pet Shop Boys fans exhibit "an undisguised love of commercial success". This was demonstrated through mailing list discussions from 1998 onwards, in which fans voiced concern over the "most commercially promising selection and marketing of singles" for the then-upcoming Nightlife, and debated the quality of the then-recent Bilingual, spurred by the album's poorer performance in sales. Most posters, Maus summarised, feared that the band's appeal would become essentially limited to a cult following; "dissent, along the lines that the fans would always have the Pet Shop Boys, no matter what happened commercially, was scarce and ineffectual". Noting the fact that Pet Shop Boys "began their career with hits", Maus made the point that this early success was valued by fans: the band's "large audiences" were just as important to "many fans" as the making of "distinctive music that individual fans loved". As of 2003, Pet Shop Boys were ranked by Billboard's Joel Whitburn (in his book Billboard's Hot Dance/Disco 1974–2003) as the fourth most successful act on the U.S. Dance/Club Play charts, behind only Madonna, Janet Jackson and Donna Summer. The history between Madonna and Pet Shop Boys goes back to 1988, with the song "Heart". In the liner notes to their 1991 greatest hits album, Discography, the band states that: "When we wrote this song ("Heart") we wanted to submit it to Madonna but didn't dare risk disappointment." Pet Shop Boys kept the song for themselves and it ended up going to number one in the UK. Later, in 1991, Madonna was referenced in a tongue-in-cheek lyric, in the song "DJ Culture", soon after she and Sean Penn had divorced. Tennant writes: "Like Liz before Betty / She after Sean / Suddenly you're missing / Then you're reborn". Madonna's album Confessions on a Dance Floor, released November 2005, includes a track called "Jump", which has close similarities to "West End Girls". An interview at Popjustice with Stuart Price, who produced Madonna's album, revealed the track "Jump" was a complete Chris Lowe inspiration. Pet Shop Boys then remixed "Sorry", the second single from the album. Madonna has used their version in her 2006 Confessions tour. In October 2005, a Swedish tribute band called West End Girls had a number three hit single in their home country, with a cover version of "Domino Dancing". In January 2006, they released their own version of "West End Girls" and an album was also released in June. In August 2014, the Pet Shop Boys appeared in the BBC Radio 4 series The Archers as last-minute headliners at the fictional festival Loxfest. Both Tennant and Lowe had speaking roles in the show. Neil Tennant, who neither denied nor confirmed gay rumours throughout the 1980s, "came out" in a 1994 interview for Attitude, a UK gay lifestyle magazine. Lowe, meanwhile, has not disclosed his own orientation. He has said (in the two-part 1996 BBC Radio 1 documentary, About), rather, that there is only "[human] sexuality". In the 1990 biography Pet Shop Boys, Literally, Tennant recalls that for a time their ex-manager, Tom Watkins, incorrectly assumed the duo to be a couple. Neil Tennant has stated that his lyrics are not specifically gay. Many of their songs are written using gender-neutral language, so that they could refer to any gender. ^ Cairns, Dan (1 February 2009). "Synth pop: Encyclopedia of Modern Music". Archived from the original on 15 June 2011. Retrieved 11 June 2012. CS1 maint: BOT: original-url status unknown (link). The Times. ^ Metzer, Greg (2008). Rock Band Name Origins: The Stories of 240 Groups and Performers. McFarland. p. 144. ISBN 978-0-7864-5531-7. ^ Herzog, Kenny (9 July 2013). "The Pet Shop Boys' Neil Tennant Explains How the World Works". Spin. Retrieved 1 July 2015. ^ Lindsay, Cam. "Pet Shop Boys A Life in Pop". Exclaim!. Retrieved 28 October 2016. ^ "Coachella 2014: Empire of the Sun, Pet Shop Boys Bring Art Pop to the Desert". Billboard.com. Retrieved 8 April 2018. ^ "Pet Shop Boys – News archive (September 2008)". Pet Shop Boys. Retrieved 8 April 2018. ^ "Pet Shop Boys: Biografie". Warner Music Germany (in German). Archived from the original on 18 November 2008. Retrieved 27 October 2008. ^ The Guinness Book of Records 1999. Guinness. 1998. p. 228. ^ "Greatest of All Time: Madonna Is Billboard's No. 1 Dance Club Songs Artist". Billboard.com. 1 December 2016. Retrieved 3 December 2016. ^ Daniel Rachel (12 September 2013). Isle of Noises: Conversations with great British songwriters. Pan Macmillan. p. 392. ^ "Pet-shop-boys-bobby-o-demos Retrieved 19 September 2013". ^ "Pet Shop Boys - The Maxi-CD Collection Of The Pet Shop Boys". Discogs. Retrieved 8 April 2018. ^ "WLIR & WDRE 92.7 FM Screamer & Sheiks of the Week". Advancedspecialties.net. 9 January 2004. Retrieved 4 January 2010. ^ Cowton, 1991. p. 15. ^ "West End Girls – Pet Shop Boys". BBC Radio 2. British Broadcasting Corporation. Retrieved 19 February 2009. ^ "Cult – Classic TV – The Clothes Show". BBC. Retrieved 10 April 2012. ^ Elizabeth Landau (7 April 2009). "Pet Shop Boys come back with a lot of 'love, etc.'". CNN. Retrieved 4 January 2010. ^ "1986 MTV Video Music Awards". Mtv.com. Retrieved 28 September 2014. ^ "Diary". The Spectator. 20 May 2009. Retrieved 9 December 2018. ^ "They did it their way". The Daily Telegraph. London. 20 November 2004. Retrieved 15 September 2010. ^ "David Bowie – Hallo Spaceboy". David Bowie at Discogs. Discogs. 2014. Retrieved 13 February 2014. ^ McKie, John (20 February 1996). "Bowie and Blair band together". London: The Independent. Retrieved 6 August 2011. ^ covdik (24 February 2009). "PSB & David Bowie Top Of The Pops" (Video upload). YouTube. Google Inc. Retrieved 13 February 2014. ^ Kenneth, Stephen. "A-Z of PSB". So Pet Shop Boys. Retrieved 14 June 2006. ^ a b c "First trio of 'Catalogue: 1985-2012' reissues are out now". Pet Shop Boys. Retrieved 29 August 2017. ^ Mosler, Tomas. "Chronology". Pet Shop Boys at dead of night. Retrieved 14 June 2006. ^ "Pet Shop Boys release 'Cubism', live DVD". Side-line.com. Retrieved 4 January 2010. ^ "Pet Shop Boys to play live in Second Life". Side-line.com. Retrieved 4 January 2010. ^ "Sam Tylor-Wood produced by Pet Shop Boys". KOMPAKT.FM. Retrieved 28 September 2014. ^ "Pet Shop Boys-News". Petshopboys.co.uk. Retrieved 28 September 2014. ^ "This is the Sam Tylor-Wood/ Pet Shop Boys song". Popjustice. Retrieved 28 September 2014. ^ "I'm in love with a German filmstar". Resident Advisor. Retrieved 28 September 2014. ^ Gordon Smart (3 October 2008). "Cheryl's song plea to Ashley". The Sun. UK. Retrieved 3 October 2008. ^ "Twitter / ?". Twitter. 20 July 2012. Archived from the original on 20 July 2012. Retrieved 8 April 2018. ^ McNulty, Bernadette (28 June 2010). "Glastonbury 2010, review". London: Telegraph.co.uk. Retrieved 6 August 2011. ^ "Pet Shop Boys – News – Ultimate Pet Shop Boys". Petshopboys.co.uk. Retrieved 6 August 2011. ^ "Pet Shop Boys – Ultimate Track-listing". Petshopboys.co.uk. Retrieved 6 August 2011. ^ "Pet Shop Boys – The Most Incredible Thing". Petshopboys.co.uk. Retrieved 6 August 2011. ^ "Sadler's Wells Theatre – Pet Shop Boys & Javier De Frutos – The Most Incredible Thing". Sadlerswells.com. Archived from the original on 10 August 2011. Retrieved 6 August 2011. ^ "BBC – Newsbeat – Pet Shop Boys join Take That on Progress UK tour". Bbc.co.uk. 4 April 2011. Retrieved 6 August 2011. ^ "Pet Texts – 15 June 2011". Pet Shop Boys. Retrieved 6 August 2011. ^ "Pet Shop Boys – Pet Texts – Songwriting". petshopboys.co.uk. 28 September 2011. Retrieved 4 November 2011. ^ "Pet Shop Boys enregistre un nouvel album à paraître en 2012". Chartsinfrance.net. 2 November 2011. Retrieved 4 November 2011. ^ a b "An interview with the Pet Shop Boys". Varsity. 10 November 2011. Retrieved 11 November 2011. ^ Brown, Mark (20 November 2011). "Evening Standard theatre awards: pair win joint prize for Frankenstein roles". London: Guardian.co.uk. Retrieved 21 November 2011. ^ "Pet Shop Boys – News – Beyond Theatre". petshopboys.co.uk. Retrieved 21 November 2011. ^ "Frankenstein pair share Best Actor honour at our Theatre Awards". Standard.co.uk. Archived from the original on 23 November 2011. Retrieved 21 November 2011. ^ "Winner". News. Retrieved 3 July 2012. ^ Newman, Paul (28 July 2012). "Wimbledon's 'wee bit slippery' courts prove a test for tennis Olympians". London: The Independent. Retrieved 28 July 2012. ^ "Elysium track-listing". Pet Shop Boys Partnership. Retrieved 28 July 2012. ^ "Elysium release dates". Pet Shop Boys Partnership. Retrieved 28 July 2012. ^ "Winner USA". Pet Shop Boys Partnership. Retrieved 8 August 2012. ^ "Winner released in UK". Pet Shop Boys Partnership. Retrieved 6 August 2012. ^ "Winner released". Pet Shop Boys Partnership. Retrieved 3 August 2012. ^ Hooton, Christopher (14 March 2013). "Pet Shop Boys Leave Parlophone, Tease New Album Electric - Metro News". Retrieved 27 December 2014. ^ "Breaking news". petshopboys.co.uk. Pet Shop Boys Partnership. 14 March 2013. Retrieved 5 July 2013. ^ "Pet Shop Boys top Official Record Store Chart". OfficialCharts.com. Official Charts Company. Retrieved 15 August 2013. ^ "Pet Shop Boys — News — Electric - the first review". Petshopboys.co.uk. Retrieved 28 September 2014. ^ Robbie Daw (21 June 2013). "Pet Shop Boys Discuss 'Electric', Their Euphoric Summer Album: Idolator Interview". Idolator. SpinMedia Publishers. Retrieved 5 July 2013. ^ Dawn (4 July 2013). "Pet Shop Boys Touring Asia Intensively for 'Electric'". Music Weekly. Music Weekly Asia. Retrieved 5 July 2013. ^ "Pet Shop Boys 'Electric' Album and World Tour". PhabLife. PhabLife. 10 June 2013. Archived from the original on 4 September 2015. Retrieved 5 July 2013. ^ "BBC Proms, 2014 Season, Prom 8: Pet Shop Boys". Bbc.co.uk. Retrieved 5 August 2014. ^ "BBC Prom 8 - Pet Shop Boys". Bbc.co.uk. Retrieved 8 April 2018. ^ "Pet Shop Boys — News — Last Electric dates". Petshopboys.co.uk. Archived from the original on 5 October 2014. Retrieved 28 September 2014. ^ ""2015 MAMA" confirms epic collaboration between Pet Shop Boys and f(x)". 19 November 2015. ^ Eurochannel. "Pet Shop Boys - British Music - Eurochannel". Eurochannel: The European TV channel - European movies, TV series and music. Retrieved 7 March 2016. ^ "Pet Shop Boys - The Pop Kids". Discogs. Retrieved 19 March 2016. ^ "Dance Club Songs". Billboard. Nielsen Business Media, Inc. 30 April 2016. Retrieved 19 April 2016. ^ Pet Shop Boys. "Pet Shop Boys - Catalogue: 1985-2012". petshopboys.co.uk. Retrieved 7 June 2017. ^ Pet Shop Boys. "Second set of Catalogue reissues announced". petshopboys.co.uk. Retrieved 31 August 2017. ^ Pet Shop Boys. "Third batch of 'Catalogue' reissues announced". petshopboys.co.uk. Retrieved 6 December 2017. ^ Pet Shop Boys. "Final batch of 'Catalogue' reissues announced". petshopboys.co.uk. Retrieved 3 July 2018. ^ Pet Shop Boys. "Final batch of 'Catalogue' reissues out now". petshopboys.co.uk. Retrieved 31 August 2018. ^ Pet Shop Boys. "Inner Sanctum DVD/Blu-ray/CD". petshopboys.co.uk. Retrieved 29 January 2019. ^ Pet Shop Boys. "Agenda". petshopboys.co.uk. Retrieved 5 February 2019. ^ "Broadcast Yourself". YouTube. Retrieved 4 January 2010. ^ "The Quietus - Features - A Quietus Interview - Pop Kid - Chris Lowe Of Pet Shop Boys Interviewed". ^ "BBC News - Pet Shop Boys to make cameo appearance on The Archers". BBC News. Retrieved 28 September 2014. ^ ">> arts >> Pet Shop Boys". glbtq. 20 September 2008. Archived from the original on 11 July 2014. Retrieved 4 January 2010. ^ "Absolutely Pet Shop Boys Unofficial web site – Interviews – Outrage, October 1994". Petshopboys.net. Archived from the original on 30 August 2009. Retrieved 4 January 2010. ^ "Pet Shop Boys – About (2xCD) at Discogs". Discogs.com. 6 November 2008. Retrieved 4 January 2010. ^ Heath, Chris (1990). Pet Shop Boys, Literally. United States of America: Da Capo Press, Inc. p. 167. ISBN 0-306-80494-8. ^ "Absolutely Pet Shop Boys Unofficial web site – Interviews – Attitude May 2002". Petshopboys.net. Archived from the original on 30 August 2009. Retrieved 4 January 2010. ^ Thompson, Ben (21 April 1996). "ARTS: AN ATTITUDE THING – Arts & Entertainment". The Independent. UK. Retrieved 4 January 2010. ^ "For Hard-Core Petheads: The Tennant Interview In Full – The Daily Dish, By Andrew Sullivan". Andrewsullivan.theatlantic.com. 5 June 2009. Retrieved 4 January 2010. Wikimedia Commons has media related to Pet Shop Boys.